The Little Ice Age – Back to the Future | Watts Up With That? Extreme scientists and politicians warn we will suffer catastrophic climate change if the earth’s average temperature rises 2.7°F above the Little Ice Age average. They claim we are in a climate crisis because average temperature has already warmed by 1.5°F since 1850 AD. Guided by climate fear, politicians fund whacky engineering schemes to shade the earth with mirrors or aerosols to lower temperatures. But the cooler Little Ice Age endured a much more disastrous climate. 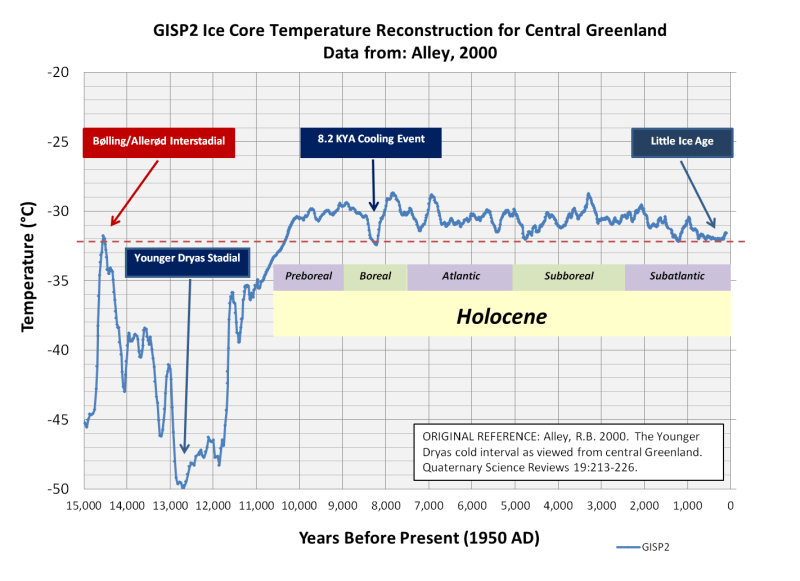 The Little Ice Age coincides with the pre-industrial period. The Little Ice Age spanned a period from 1300 AD to 1850 AD, but the exact timing varies. It was a time of great droughts, retreating tree lines, and agricultural failures leading to massive global famines and rampant epidemics. Meanwhile advancing glaciers demolished European villages and farms and extensive sea ice blocked harbors and prevented trade. Dr. Michael Mann who preaches dire predictions wrought by global warming described the Little Ice Age as a period of widespread “famine, disease, and increased child mortality in Europe during the 17th–19th century, probably related, at least in part, to colder temperatures and altered weather conditions.” In contrast to current models suggesting global warming will cause wild weather swings, Mann concluded “the Little Ice Age may have been more significant in terms of increased variability of the climate”. Indeed, historical documents from the Little Ice Age describe wild climate swings with extremely cold winters followed by very warm summers, and cold wet years followed by cold dry years. A series of Little Ice Age droughts lasting several decades devastated Asia between the mid 1300s and 1400s. Resulting famines caused significant societal upheaval within India, China, Sri Lanka, and Cambodia. Bad weather resulted in the Great Famine of 1315-1317 which decimated Europe causing extreme levels of crime, disease, mass death, cannibalism and infanticide. The North American tree-ring data reveal megadroughts lasting several decades during the cool 1500s. The Victorian Great Drought from 1876 to 1878 brought great suffering across much of the tropics with India devastated the most. More than 30 million people are thought to have died at this time from famine worldwide. The Little Ice Age droughts and famines forced great societal upheaval, and the resulting climate change refugees were forced to seek better lands. But those movements also spread horrendous epidemics. Wild climate swings brought cold and dry weather to central Asia. That forced the Mongols to search for better grazing. As they invaded new territories they spread the Bubonic plague which had devastated parts of Asia earlier. In the 1300s the Mongols passed the plague to Italian merchant ships who then brought it to Europe where it quickly killed one third of Europe’s population. European explorers looking for new trade routes brought smallpox to the Americas, causing small native tribes to go extinct and decimating 25% to 50% of larger tribes. Introduced diseases rapidly reduced Mexico’s population from 30 million to 3 million. By the 1700s a new killer began to dominate – accidental hypothermia. When indoor temperatures fall below 48°F for prolonged periods, the human body struggles to keep warm, setting off a series of reactions that causes stress and can result in heart attacks. As recently as the 1960s in Great Britain, 20,000 elderly and malnourished people who lacked central heating died from accidental hypothermia. As people with poor heating faced bouts of extreme cold in the 1700s, accidental hypothermia was rampant. What caused the tragic climate changes of the Little Ice Age? 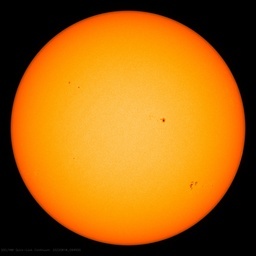 Some scientists suggest lower solar output associated with periods of fewer sunspots. Increasing solar output then reversed the cooling and warmed the 20th century world. As solar output is now falling to the lows of the Little Ice Age, a natural experiment is now in progress testing that solar theory. However other scientists suggest it was rising CO2 that delivered the world from the Little Ice Age. Increasing CO2 also has a beneficial fertilization effect that is greening the earth. The 20th century warming, whether natural or driven by rising CO2 concentrations, has lengthened the growing season. Famines are being eliminated. Tree-lines stopped retreating and trees are now reclaiming territory lost over the past 500 years. So why is it that now we face a climate crisis? At the end of the 1300’s Great Famine and the Bubonic Plague epidemic, the earth sustained 350 million people. With today’s advances in technology and milder growing conditions, record high crop yields are now feeding a human population that ballooned to over 7.6 billion. So, the notion that cooler times represent the “good old days” and we are now in a warmer climate crisis seems truly absurd. Isn’t that why Canadians head south for retirement? Isn’t that why Florida and Arizona are prime retirement communities? Why is this so difficult to understand? Cold is bad! Extremes are bad, moderate is good (just like the rule for living). The difference is that extreme heat beyond human tolerance is rare on the planet, compared to the many regions where humans need fire to survive. Furthermore, as I see it the tropics are observed to be self-regulating, and anomalous warming is chiefly observed at the most unlivable latitudes of the planet during their most frigid seasons. That is perhaps the least understood concept by believers in the omnipotent greenhouse in carbon. It really is the smoking gun that fingers water (solid, liquid, vapor) as the primary suspect in climate change, with accomplices like Solar variance and volcanism. All these are trumped by the Milankovitch cycles and bolide collisions. A huge factor in driving climate that most never acknowledge is space weather and earths magnetic field. The weakening magnetosphere has a profound effect on cloud nucleation and albedo. Also history shows us a significant increase in volcanic activity that also can significantly reduce surface temperature on earth. Co2 is vilified and is actually a great benefit to humanity and the food supply. The general mainstream global warming theories are false and all of their dire predictions are failing. Heaven and Earth, Global Warming: The Missing Science. Over 2,000 ref’s to peer-reviewed papers etc & well indexed. 500 pages +, with an afterword by Lord Monckton & an endorsement by Vaclav Klaus, I know of no better introduction, for the layman, to how climate change really works. Human Caused Global Warming, The Biggest Deception In History. All the science & scandals, all the politics & profiteers. & he names their motives: a vast depopulation (Turner wants a 95% reduction, 13 of 14 now alive), a one-world totalitarian govt & deindustrialisation. Forward to a feudal world of Lords & serfs. as I see it the tropics are observed to be self-regulating, and anomalous warming is chiefly observed at the most unlivable latitudes of the planet during their most frigid seasons. My experience is that the tropics are very stable, ie self-regulating, near the ocean where y is very humid. Where I live the temperature is pretty stable day to day except for a couple of times each year when the wind changes to come from inland. Inland at the same latitude, the temperature can vary wildly day to day, and even hour to hour. Further away from the equator, they’re seems to be less stability, and less humidity. My conclusion is that it is the humidity causing stability as well as, or possibly because of, the tropical latitude. … add to your comment, and the majority of the warming is at night, reducing frost damage. Only Government can take the most essential for all life trace gas that feeds billions and makes things green, and demonize it, calling efforts to reduce it green. Milton Freeman was right – creating a sand shortage in a desert. So I hope Mr Steel enjoys his retirement and will perhaps inform us of how his CAGW. skepticism fared in that University. Also I am curious if his former department has taken a more political correct stance with his retirement. The vast majority of the average temperature rise from 1850 to present is not in much higher maximum temperatures, but higher minimum temperatures, less cold higher latitudes, and less cold winters. These make a better, not worse global climate, with very little disadvantage. Complaining about this is nuts. Problem is the trend….the warming is getting more and more every year. Just about every year over the past 20 years has been hotter than the previous year. There is a massive ice shelf….the size of Florida and 1,000 feet thick in Antarctica showing signs of an imminent collapse. It is estimated to raise sea levels by 2, possibly 3 feet when it goes. It currently holds back glaciers that would follow with the stop gap gone. Kiss Florida and all other low lying areas goodbye….. I have argued with one guy who thinks the increased crop yields from CO2 enrichment is a crisis since it lowers nutritional content. These people pretend to care about the poor, but they assume, nay insist that they remain poor. How can you convince them that more energy means less poverty and greater availability of nutrition? No matter what, they will find crisis and in the process fulfill their own prophecies, and ignore the benefits that could prevent a real one, indeed have done so. They invent their Hobgoblins as they go along. What they really care about is reducing population. They claim to care about the poor. What they want to do about it is eliminate them. not by enriching them but by removing them from the population numbers. Planned Parenthood is about population control it is not about women’s health anymore than the IPCC is about climate change. It is all about controlling future populations and what those alive, amidst the great unwashed non elites, will be allowed to do by central planning. This all ties together as part of the lefts master plan. And their end justifies their means. Planned Parenthood is more than about population control. It was founded and still operates on the principle of reducing undesirable groups of people. If it isn’t, why are they concentrated in poor, black communities, and why, nationwide are 35% of abortions done on black women, and in some areas in the south 65%? They have always been for eliminating non-white peoples. Ignoring, of course, that wealthier people of all stripes have easy access to doctors and medical facilities denied to poorer folks. Of course, Planned Parenthood operates in the poorer districts because they are needed there, not in wealthy suburbs. Making your post Richard, a racist intolerant rant, coupled with unrelated percentages. Richard’s post is 100% historically accurate. Your accusation of “a racist intolerant rant” is completely ignorant. Planned Parenthood has never disavowed any of these truths, instead they almost deify her. No it makes his post calling out the racism of planned parenthood which was founded by a racist eugenics believer to eliminate minorities as Margaret Sanger stated several times and his percentages are dead on and are often quoted by Dr. Alveta King maybe you misinterpreted his post but if not you need to look at the racist past and present of Planned Parenthood. perhaps you would profit from reading nuclear PhD engineer Robert Zubrin’s book? Reveals that modern “environmentalism” is for depopulation, & deindustrialisation, tracing the diabolic plot back to the racist, eugenicist, Darwinian & Malthusian roots. Reveals that safe, clean nuclear power is demonised, as are humans, by the 1%s ownership & control of the MSM & spineless politicians & bureaucracy. Reveals that population growth pushes both prosperity, knowledge & scientific progress. Mankind loses this “environmental debate” & what’s left marches backward to a feudal future of serfdom & slavery. Mankind wins this “environmental debate” & our future is as infinite as the Universe, so far as we can see at this moment. Because wealthier communities have access to the resources to pay for their own family planning. It is poorer communities that need this resource. This is down to the relative poverty of black communities due to social factors in the USA. Lets fix or refine your post Griff. This is down to the relative poverty of black communities due to the black victim culture promoted and perpetuated by statist in desperate need of victims to further their power over others addiction. What Griff conveniently omitted from his rant is the most critical factor affecting blacks in America is the extreme low rate of father’s in the homes. Statists don’t ever accept they are responsible for exacerbating the very problems they claim to want to curtail, because adding external authority to the mix seldom does anything other than compound the problem. I suggest it’s not accidental, as politicians are not in the business of actually making lives better, but rather marginally worse so they have perpetual platforms to trick the masses into continuing to vote for them and keep them in power. The black population in America was decimated by a combination of leftist policies and disgusting politicians dirty work. 1. Minimum wage was enacted by white southern Democrats so that their white children would be able to stay employed on similar levels as blacks, because then, blacks had lower cost of living and were able to access work, even if for less money than whites. They were actually gainfully employed at higher rates than young whites. 2. Welfare – it was well established that social workers would go round informing black mother’s they could get “free” government money provided no father was in the home. Prior to welfare 80% of black homes were intact, just 65+ years later that number is down to approximately 30%. Or for the math challenged, that subculture went from having father’s in 8/10 homes to less than 3/10 families with a father in the home. Nearly every statistic for violent crime, incarceration rates, low education, poverty, and others can be traced to fatherless homes. Add on top of that an average IQ of 85 (which also coincides with irrationality, violent tendencies, and poor decision making) and you have a recipe for disaster, the likes of which we’ve now witnessed. 3. Iran Contra scandal involving the Clinton cartel. Through Mena Arkansas national guard Outpost, then governor slick Willy oversaw the manufacturing of firearms to be traded for drugs to the Nicaraguan contras. Barry Seal delivered the crack cocaine back to the States where it was then transported to inner cities across America, funds of which were supplied to Iran during the November surprise. This is well established but of course politicians are rarely held accountable for their crimes. So you have a population that has barely any fathers, with mother’s who routinely use force to rear their children (which then demonstrates violence is a means to an end), who experienced generations of not working, and then terrible drugs are introduced into their communities, by you guessed it, Democrats. Don’t forget the music industry, ran by another group of hateful racists, exploiting blacks to exploit themselves by maintaining a culture that hates women and homosexuals, thinks it’s cool to be a thug, parade violence as heroic, and refuses to take ownership for their behavior least they be accused by their peers of being an uncle Tom. 4. They are undeniably, for whatever reason, when viewing the population at large, a full standard deviation less intelligent than Hispanics, whites, Asians, and ashkenazi Jews, according to very well researched IQ testing data compiled over 100 years. (At least from the professionals opinion who were involved in these studies). So rather than discover ways and methods to improve cognitive functioning, professions at which they would succeed, desire to be civil and successful, folks like Griff blame wealth. These people love not the poor, oh no, rather they hate the rich. If you actually cared blacks or the poor, you would accept reality and figure out how to voluntarily assist those communities rather than stealing our money to through at people who will use it for drugs and violence, further destroying their already diseased communities. But let’s leave Griff to pretend it’s all about wealth and not intact family units, with a strong male role model to firmly raise the children. Richard, as the elites are focused on population control, they wouldn’t be concerned about reducing the best and brightest, in their minds, they would of course be invested in reducing the population of those most in need in of support and help from on high. You can choose to make PP all about race but that would be shortsighted. Just because they pluck low hanging fruit doesn’t mean that is their singular purpose. Not everyone living in the urban centers are black in point of fact most are not but they are disproportionately poor and come in all races, colors, creeds and nationalities. Loss of nutritional value may be caused by insufficient supply of nutrients or minerals and constrained growth volume; unlike what is available in field plantings. i.e., experimenters that claim the increased growth causes reduced nutrients depend upon small closed system environments. Where the researchers are responsible for supplying all nutrients growing plants require and where their plants are constrained to small root and plant containers with minimal growing media and room for total plant growth. A problem that most indoor greenhouse operators carefully avoid by supplying controlled complete nutrients flows in hydroponic growth pans and plenty of growing room. Farmers will not suffer from choked root mass area or stunted plant growth in field crops. Greenhouse and growth chamber studies have reported reductions in concentrations of nutrient elements other than N in plant tissue due to increased biomass production with elevated CO2 (Peet et al., 1986; Overdieck, 1993). Human beings lack both a cecum (fermentation gut) and the enzyme which ferments and breaks down cellulose (plant cells) in herbivores. Most of our evolution took place during the great glaciations, when there was nothing green or fruity around for us to eat. So we ate megafauna and expanded our brain size. Our digestive apparatus is much closer to cats and dogs than herbivores; we also have binocular vision with eyes on the front of our head for a REASON. Anyone advising a plant-based diet where animal products are restricted or absent may be assumed to be trying to downsize the population, because absent B12, long-chain fatty acids, CLA etc. which can only be obtained in absorbable form from sources like fish, red meat, and butter, you’re going to be infertile really fast. Extra fast if you consume soy–phytoestrogens are the reason they fed it to monks in Asian monasteries to kill any sexual interest. When one understands the biochemistry, arguing over the relative nutrient levels of plants for human consumption makes about as much sense as comparing wood shavings to straw. Pass me my pastured pulled pork instead, PLEASE! 😉 And I don’t really care what Bill Gates thinks. Just be sure to differentiate between vegan and vegetarian where the ladder meaning is broader then the literal. Nutritional yeast is also a good source. I also disputed some of your digestive track smilies of humans to other animals. I went through high school and beyond, sans fish and meat, and was a very good athlete, wrestling and gymnastics, and married and had four children. I used to ask my skeptics if they ever net a weak gorilla! That being said I detest the political statist condemnation of meat eaters and attempts to legislate diet. Also, fanaticism in most forms is both inadvisable and unattractive. In that spirit I do now partake of fish and if I am a guest and served meat, I enjoy it! Additionally, the CO2 increase does more rapidly deplete minerals such as nitrogen from the soil, yet, just like with the nutritional content, there is no increase in mineral depletion per material amount of bio-mass. It is just that increased CO2 produces more bio-mass so naturally more minerals are needed to produce it. Further studies however show that additional CO2 actually INCREASES nitrogen efficiency! Also farmers well understand the need for fertilizers and crop rotation. So consider sending this information to your friend and a link to CO2 Science where real science proves the assertions. Excellent post Jim. You can see why alarmists don’t like history much, either human or geological. It drives a horse and cart through their doomster narratives and prophecies. Humanity thrives in warm, relatively benign weather such as we have enjoyed over the past century. If the masses were aware of the climatic disasters that a cooler, wilder, Co2 deficient world would bring them then the global warming scam would be as dead as the proverbial dodo. Only a world that has fallen for the Mann Made Climate Change concept, would be silly enough to introduce punitive taxes in Canada on CO2 emissions. Taxing the very thing that they claim would make Canada warmer? It must be s socialist thing. Who knew that dealing with Climate Change would ‘end racism’ ? Personally, I have been a strong supporter of Global Warming because the alternative is not good at all. I am completely baffled as to why any Canadian would object to Canada warming 2 or 3 degrees C or F; it doesn’t matter which at Canada’s current temperatures. According to some Prof from Waterloo U interviewed by the CBC, British Columbia has temperatures 30 C above average. He didn’t give a place name, but he sounded sincere. Isn’t that want counts? Being sincere when you lie through your teeth? Canada is warming at twice the rate of the world, he trilled. The rate is about zero so twice zero is a number quite a stretch less than one. We Canuks should not entertain any fears about warming until the tree line has moved back to where it was 8000 years ago. That might not happen before the next ice age ends. The latest story from CBC is that not only is there warming in Canada, it’s worse in the far north! One might think that was a good thing, but you know Canada…. Rational thought and communicating with integrity are candles against the spreading darkness. Thank you for lighting so many candles. Wouldn’t “more than 1.7 F” be 1.8 F? Otherwise known as 1 C? Doesn’t sound very dire to me. 2 The rise in temperature of 1.5degF since 1850 is all due to adjustments. How can you argue that if all this rise in temperatures post 1850 is due to adjustments made to the temperatures post 1850 means that we are still in the LIA? We came out of the LIA due to the rise in temperatures before and up to 1850. Personally, I do not consider that we have exited the LIA until temperatures are as warm as they were in the MWP, ie., in the period before the descent into the LIA. On that basis, the question to be answered is when have the temperatures seen in the MWP been matched or surpassed? Since we know that temperatures continued to rise in fits and starts and particularly during the period 1860 to 1880 and the period 1920 to 1940, and since the temperature as at 1940 appears not to have been as warm as the MWP, there is a strong case that the LIA did not end in 1850. …only in the FUBAR world of computer numbers and algorithms that can take completely inadequate numbers from 1850 and beyond, and incorporate vastly changing numbers from ever changing number of instruments in poorly sited locations that are themselves environmentally changing, can Steve Mosher’s comment have any cogent to reality. In long term well sited stations like the USHCN the raw numbers show a warmer past and a colder present. I love drive by drivel. And provides a false narrative that everywhere on the globe has warmed. Some places have, some haven’t, some have cooled. Jeff: Not only that, but they can’t even call them cooling areas. They call them “warm holes” (e.g.. SE USA). Our brutal prairie winter of two months length still would be a “cold snap” while 3 days above average is a “heat wave”. It’s all a game of words. Ever hear the story of Goldilocks? Thoughts: Cold, dry air would decrease clouds and increase solar insolation, which would result in a lot of heat storage into oceans. Eventually, oceans would warm enough to hypercharge the water cycle, resulting in warmer, humid air. No need to consider the tiny change in solar output. Cloud cover/clear sky combined with heat storage and heat release are far more powerful change agents. It is the ocean that determines the global atmospheric temps. Yup, and the sun, and modulation thereof by clouds, that controls the ocean heat content which controls the atmospheric temps. They have the tail wagging the dog. Nonsense. Not enough energy in tiny solar variation effects at the ocean surface to make a difference over and above Earth’s intrinsic factors. Pamela: Your comment does not contradict what you think it contradicted. No one said the TSI changes warmed or cooled anything by virtue of TSI. Rather, as you well know, there was a claim that you seemed to endorse, that water vapor in different forms can act as a thermostat. The argument (which I am not endorsing or refuting) was that changes in solar could affect clouds, which affect how heat is retained or reflected. The solar spectrum changes far more then TSI. This change is often multiple decades long. Therefore a small change of input into a long residence time heat sink, can, over time, have a much greater affect on total energy in the system. In the case of solar insolation AND spectrum change, the energy difference entering the oceans can accumulate daily for decades, or for as long as the input change occurs. Good post Pamela, yet into the small solar change one must incorporate a much larger change in solar spectrum, and from there, a much larger change in a heat sink like the oceans, where the residence time of said solar spectrum change can accumulate or reduce absorbed energy changes for decades. Man will have to do what man has done since he first walked on the planet, adapt. Maybe it is me, but I can no longer seem to get a search engine to return anything relating to Greenland being blocked in by ice during the LIA. Was this statement dis-proven or not? During the Little Ice Age, access to Greenland was largely cut off by ice from 1410 to the 1720s. The Little Ice Age (LIA) was most likely the coldest period of the Holocene Epoch. In Central Greenland it was roughly the same temperature as it was during the Bølling-Allerød glacial interstadial. 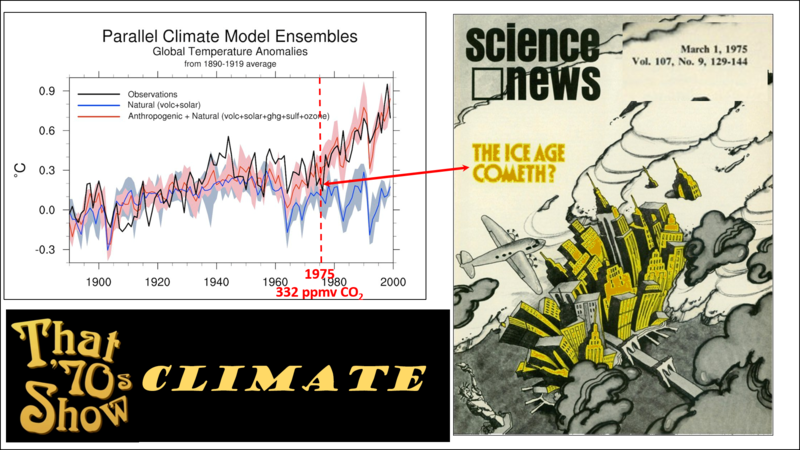 The modern rise in atmospheric CO2 lagged behind the warm up from the LIA. The LIA clearly appears to be related to a roughly 1,000-yr quasi-periodic fluctuation. 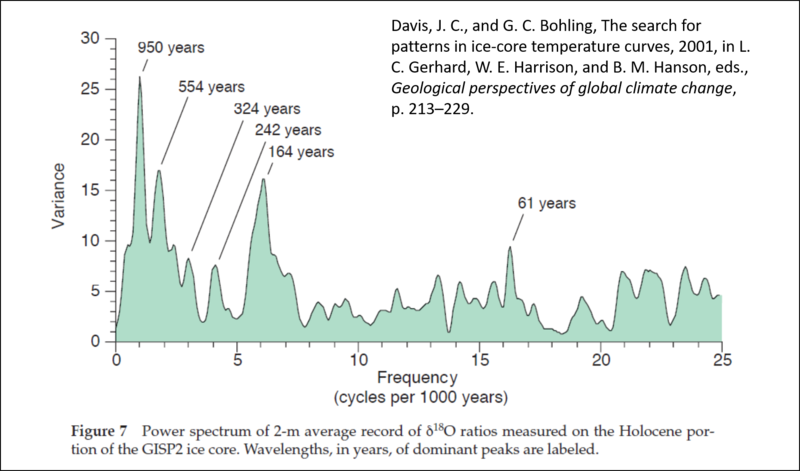 The 1,000-yr quasi-periodic fluctuation appears to be the dominant climate signal of the Holocene. And the modern warming is statistically indistinguishable from the Medieval Warm Period. Yet we’re supposed to destroy our economy and become good little Marxists because Hockey Stick-head is a fracking moron. David, your graphs are really helpful. Are you compiling them into a down loadable reference? I have been saving them from time to time and now have a folder with a hodgepodge of graphs, plots etc. Not the same value without the context of the posts. My blog, “Debunkhouse,” has largely become a scratch pad and cluttered file room for my posts here. But I did post this compilation of my comments and images in this post. Thanks, I’ll go there and look around. I’m so busy doing other things I can’t keep this stuff organized. I studied geology, I do have an overall perspective on the vastness of time/processes/changes. It’s why I’m skeptical. But it’s the details I’ve either forgotten, or weren’t really known before 1984 when I graduated and went into a 32 year career in optics (I like geology but Oil Glut!) What I don’t have yet, in my brain, is a complete, concise, and coherent story of the past events and changes, the story that lays waste to the alarmist position of everything happening now (true or not) is somehow unprecedented. Actually, modern warming IS distinguishable from the Medieval Warm Period in a different manner than “statistically,” (and only NOT “statistically” distinguishable due to “adjustments” to the temperature “records”) – those trees, carbon dated to the MWP, that used to grow higher on the mountains, where it is too cold for them to grow today, tell us it was warmer then. 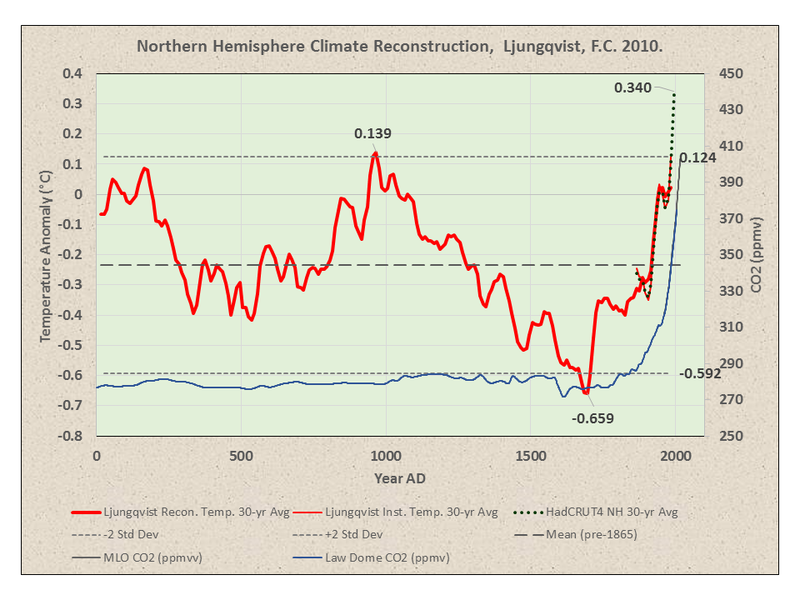 I like seeing the Ljungqvist charts & notice that after the cold period of 300 to 700 A.D there was a temperature rise without significant retreat until around 900 A.D. In England back around 750 A.D. the river Thames was more shallow & ran slower, reaching in some places another 70 to 90 meters inland than currently. 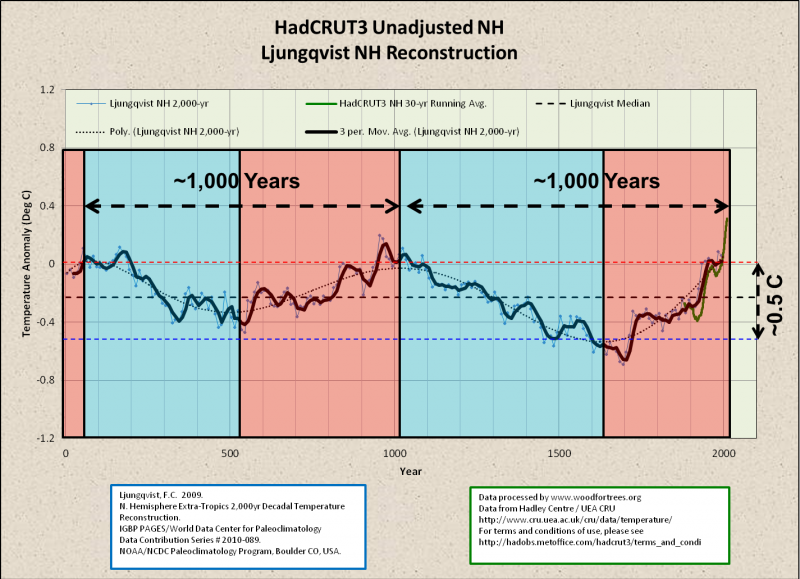 So it seems the subsequent warming that Ljungqvists’ data shows is reflected in this water level changes; which pre-dated the little ice age. The Romans in England had a town named Aquamannia (now known as Bath); their road from London to there was called Akemennestraete, which came to be called The Strand. Back around ~750 A.D. that road was only about 45 meters away from the river Thames & St. Paul’s church site was nearer to the Thames. The current park known as Victoria Embankment is actually about 5 meters on top of the earlier shoreline of the river Thames. Back around 750 A.D. the Port of London’s south west expanse reached to the corner off where Trafalger Square was established & it’s north east expanse reached to where the eastern side of King’s College would be built. 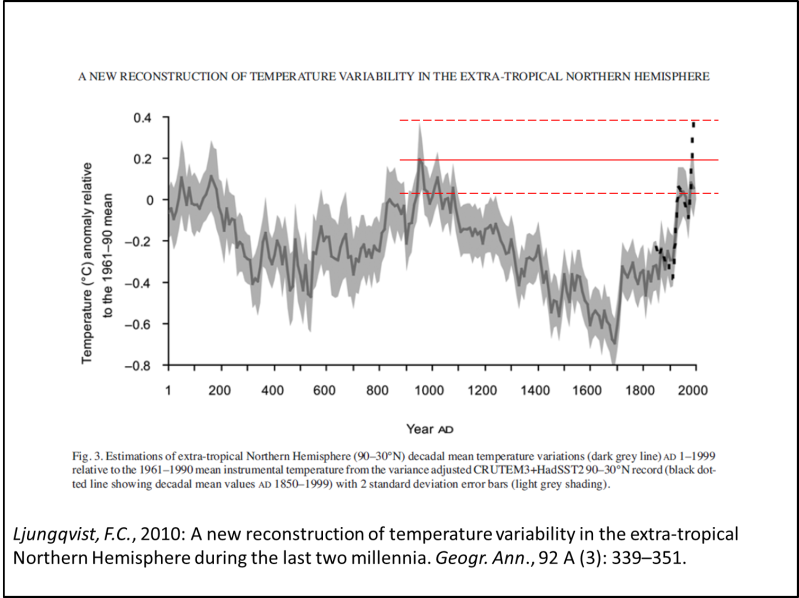 So, the warming anomoly of 0.139 °C up to 1,000 A.D. (as per 2nd chart w/red line) seems to have created conditions which were able to be taken advantage of. No it’s nothing like “clear”. Just 2 “cycles” in no way qualifies it as that . There were two warming periods in the 20th Century, The Early Twentieth Century Warming (ETCW) from 1910 to 1940, and then the Late Twentieth Century Warming (LTCW) from 1980 to the present. The IPCC says CO2 was not a significant factor in the ETCW warming. In other words, Mother Nature was the main driver during this time period. The ETCW and the LTCW are equal in the magnitude of their warming, and the highpoint of each period was within a few tenths of a degree of one another, but according to the IPCC, CO2 was not a factor in the ETCW and Mother Nature dominated that period of warming, but CO2 was a major factor in the LTCW. That doesn’t make sense. The same magnitude of warming, and the same highpoint, so no additional heat is required to raise the temperatures of today to the levels of the 1930’s, yet the IPCC thinks CO2 is now the driver. We know why: Because they get paid in many ways, for thinking that way. So far, there is no evidence CO2 is driving anything. It could all very easily be driven by Mother Nature. She did it before, and She can be doing it now. We should find out one way or the other before we go throwing TRILLIONS of dollars away on wild goose chases. It has cooled about 0.6C since the most recent temperature highpoint in Feb. 2016 (UAH satellite chart). If those at the IPCC are using Feb. 2016 as their measure and claim that we have already reached 1.5C above the “optimum temperature”, then we need to subtract 0.6C from that 1.5C figure. That makes it less scary doesn’t it? Or maybe more scary if you think the temperatures are actually declining in a trend. Let’s hope any decline mimics the previous temperature declines in 1910 and 1980, and then the temperatures will rebound up to the levels they have reached in the past, like today. Up for 30-35 years, down for 30-35 years, Up and down and Up and down and on and on. The Alarmists want us to believe that the temperatures just go Up, Up, Up, Up, Up. Right now they are going down. Hang in there alarmists, you still have a little bit of an uptrend going for you, but how long do you think that’s going to last? We shall see, won’t we. It’s particularly ironic that LTCW began when we were on the verge of an ice age. Whenever there’s some falling of temps, the climate fascists will queue up the “But the long-term trend is still up!” twaddle. I like to respond with the image of a roller coaster, having just topped it’s initial hill, as it starts going down. At each point as it DESCENDS the first hill, anyone using the start point where the coaster begins could say that the “long term trend” of it’s motion, based on beginning and end points, is “still up,” but that tells you ABSOLUTELY NOTHING USEFUL in determining whether the coaster is in fact going up or down. Now just insert LIA for the start point of the coaster, and any point beyond its peak height for “today’s temperature,” and then you can dismiss the “long term trend is still up” blather for what it is. Still waiting for that, but it’s not coming, BECAUSE THEY’RE WRONG. Chaos is the opportunity for change…….. I suspect it’s a case of if it’s not on the touchscreen today it didn’t happen but the newsworthy stuff is mostly all bad news from around the globe so naturally we’re living in the worst of times and somebody needs to fix it quick. There’s no shortage of volunteers to do that if the pay and conditions are good as it sure beats working for a living. Given the current rate and direction of climate science discovery, it may take a millennium to understand much. And we have that much time if allowed time depends on climate change. Of all the climate forcings, the desperate insistence on choosing an either/or answer very soon is the most dangerous. Jim, many of your sentences would benefit from the efficient use of commas. Here’s an example. And yet, they’re are other posters who spread commas liberaly, without any regard as to where they should be used. I find this terribly difficult to read. Perhaps posters can borrow sone commas from each other where necessary? We can reduce global CO2 emissions by 86.9%, if CO2 causes global warming, we will be forced to emit CO2, that is why we set it up so we could. As usual, Jim Steele shows up as a scholar and a gentleman. Unfortunately, that is a language that few people speak anymore. Secondly, he has wonderful news for the masses, but good news is not acceptable and will not be tolerated, much less disseminated. Frankly, I don’t have any hope for a cure of the insanity that is man-made climate change hype. A few days ago, my well-educated, above IQ sister said that she is really worried about the future of the Earth and human race, due to man-made climate change. The misinformation and hype on the issue is so pervasive, she can’t believe her little brother knows more about it than “all the other scientists”! Climate is a very complicated thing, but “warmer is better” is a really simple concept that is extremely evident in human history in the mid-latitudes. How is it possible that a group of people have managed to terrorize much of the Western Hemisphere with the lie that they would be better off colder? Its just nutty-stupid! So the zombie apocalypse is truly upon us!! There is an age-old human cultural trait of predicting apocalypse. The modern secular version of this is climate alarmism. I was struck by Kevin Trenberth stating that the next level of refinement of climate models needs to be the ability to predict tipping points. Tipping points — the horsemen of the eco-apocalypse. The specter of tipping points allows climate alarmists to immerse themselves in climate catastrophe in spite of unprecedented human prosperity, aided by the warming trend since the Little Ice Age. I would have them discuss it with Dr Brown of Duke University. See his slashdot and wuwt posts about the computing requirements for even basic accuracy of climate models. We need 30 orders of magnitude more computing power to even have a chance at it. I am told that the quantum computer known as Earth is able to compute climate in real time. Let’s call it gAIa, yes? Stranger still an identical earth would not have an identical climate to earth. We see this in climate models where two runs of the same model return different climate predictions. There is an age-old human cultural trait of predicting apocalypse. It is a Judeo-Christian tradition. Other cultures are more into cyclical interpretations of Time. Yeah, that history repeats itself-literally. I’ve just assumed, that base on the Mayan Long Count, we are already dead since 2012. That’ll only work until we lift up the carpet to reveal all of the supposed “tipping points” they have swept under it that ALREADY HAPPENED, with NO “catastrophe” ensuing. What I’m used to hearing is 2 degrees C (3.6 degrees F) above pre-industrial is what needs to not be exceeded in order to avoid an intolerable amount of melting of Greenland’s ice sheet. Recently, some moved the goalposts to 1.5 degrees C. I suspect that’s because global temperature may not get past 2 degrees C above pre-industrial even if little or nothing is done. (Especially if it turns out that lower figures of climate sensitivity such as those from studies by Nick Lewis and Lewis & Curry are correct). Formerly the beginning point of human CO2 emissions to affect the GAT was 1950. The sudden turn to cold and rain in 1315 for 3 seasons caused a die-off of some 10 to 15 percent. The rain washed away topsoil, farm animals died of weather made worse diseases. Salt could not be produced reducing the ability to preserve what food there was. That cooling was a horror-show for northern Europeans. The previous warm period was so prosperous that the economy could afford to build magnificent cathedrals. Then it was some of the worst famines in history. Reality is finally beginning to intrude upon the dangerous global warming meme. Hansen et al 2018 “Global Temperature in 2017” said “However, the solar variability is not negligible in comparison with the energy imbalance that drives global temperature change. Therefore, because of the combination of the strong 2016 El Niño and the phase of the solar cycle, it is plausible, if not likely, that the next 10 years of global temperature change will leave an impression of a ‘global warming hiatus’. The reality is that Earth’s climate is the result of resonances and beats between various quasi-cyclic processes of varying wavelengths. It is not possible to forecast the future unless we have a good understanding of where the earth is in relation to the current phases of these different interacting natural quasi-periodicities which fall into two main categories. b) Solar “activity” cycles with possibly multi-millennial, millennial, centennial and decadal time scales. When analyzing complex systems with multiple interacting variables it is useful to note the advice of Enrico Fermi who reportedly said “never make something more accurate than absolutely necessary”. The 2017 paper proposed a simple heuristic approach to climate science which plausibly proposes that a Millennial Turning Point (MTP) and peak in solar activity was reached in 1991,that this turning point correlates with a temperature turning point in 2003/4, and that a general cooling trend will now follow until approximately 2650. The establishment’s dangerous global warming meme, the associated IPCC series of reports ,the entire UNFCCC circus, the recent hysterical IPCC SR1.5 proposals and Nordhaus’ recent Nobel prize are founded on two basic errors in scientific judgement. First – the sample size is too small. 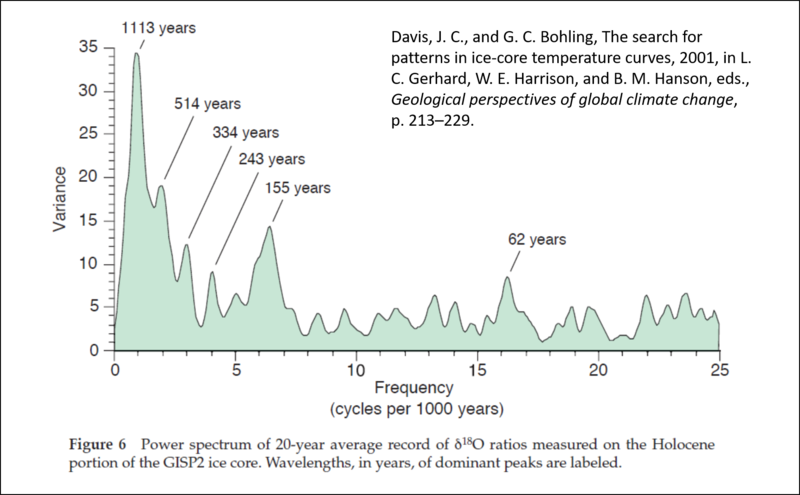 Most IPCC model studies retrofit from the present back for only 100 – 150 years when the currently most important climate controlling, largest amplitude, solar activity cycle is millennial. This means that all climate model temperature outcomes are too hot and likely fall outside of the real future world. (See Kahneman -. Thinking Fast and Slow p 118) Second – the models make the fundamental scientific error of forecasting straight ahead beyond the Millennial Turning Point (MTP) and peak in solar activity which was reached in 1991.These errors are compounded by confirmation bias and academic consensus group think. Wonderful post! However, he only briefly mentions the solar output as a small factor. It’s a much bigger factor than most give it credit for. During this little ice age, especially the 1300-1500 (when the plague and drought were at their worst) was during a period of sunspot inactivity, known as a Solar Minimum. Dr. Valentina Zharkova et. al has produced models following the sun’s cycles. We have already entered another solar minimum. Their models (as well as other solar physicist’s models) predict that this next minimum will be far worse than the last one. The sun is by far the most important factor when considering the temperature of our planet! Please do a little research into the grand solar minimum. Solar activity is not falling to the lows of the Little Ice Age. We are just in a centennial low that has significantly higher levels of solar activity than any of the three solar grand maxima of the LIA. Even if solar activity was that low and we entered a solar grand minimum (we will not), that doesn’t mean we would be in a LIA climate, it means it would be cooling, but from present temperatures it would take 2-3 centuries of cooling to reach a LIA-like climate. Whether solar activity reaches levels of the Maunder Minimum, or just reach your “centennial low”, I have no way of knowing. Many hypotheses about the sun’s behavior so I think your assertions are too confident based on our limited understanding. Whatever the case may be, solar activity has definitely been dropping the past 2 decades. so I think your assertions are too confident based on our limited understanding. I understand that. However I have studied the question in detail. 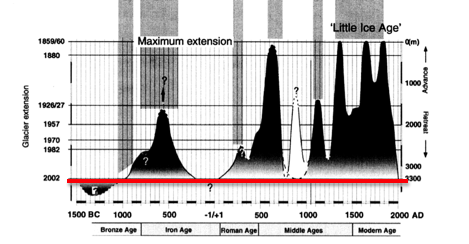 I have analyzed the distribution of solar grand minima throughout the Holocene and it is not random. The probability of a 21st century SGM is very low. On top of that SC25 has been predicted to have more activity than SC24 by polar fields. There is no reason to think solar activity is going to be any lower. Quite the contrary it is more likely that it will increase. Those that predict a SGM are very likely to be wrong, and those that think a LIA type of climate is possible in the 21st century are equally wrong. Javier, asserton is unwise in these matters. Others of us study them too and even get to experience effects realtime, fulltime, lifetime. We know when things are really changing and being scientifically-trained, take note and seek answers. We do understand the experiment is always in progress…..
asserton is unwise in these matters. Quite the contrary. The only way to advance knowledge is to study the evidence, elaborate hypotheses that explain it, and then test the hypotheses against new evidence. Plenty of people have made assertions that we are entering a new grand solar minimum. They have published them. Valentina Zharkova, Nils-Axel Mörner, Salvador, Steinhilber, among others. I am making the opposite assertion. In just a few years SC25 will provide new evidence that will show who’s hypothesis is correct. Except that, in geological history, cooling is not gradual but abrupt. Increased albedo is regarded as the main culprit (reflective forcing). Warming periods, in contrast, are gradual. That is not correct. The peak of the Medieval Warm Period was around AD 1100, and the cold of the LIA started around 1300. In between 200 years of cooling. Really abrupt changes of temperature are exceptional, associated to Dansgaard-Oescheger events and the outbreak of Lakes Agassiz and Ojibwah. In both cases there is a high enthalpy or low enthalpy store that is released abruptly. Otherwise it takes time to change the temperature of the Earth, because the Earth resists changes. Absolutely. Evolution has forced us to quickly forget past disasters, because if we clutter up our minds with them we would not be able to concentrate on the imperative of immediate survival and thus pass on our genes. Evolution has also made us foresee a future full of threats because if we don’t we will drop our guard and thus reduce our chances of immediate survival. These survival instincts which evolved on the East African Savannah are carried with us today. Hence the ease with which CAGW is promulgated. Climate Change and Organized Religion are two sides of the same coin. They both preach salvation through obedience. While those doing the preaching obey not. The Rhone Glacier in the picture. Yeah. Truth hurts, doesn’t it. Around 4000 years ago the ice caps and glaciers had reached there minimums. Then in what has been dubbed the Neoglaciation, glaciers began to grow. Warming spikes caused rapid retreat followed by a greater glacial as seen in linked graph. The Little Ice Age is the greatest cold anomaly in the past 4000 years. Why do the alarmists want to go back to the 1850s? The winters were cold, the summers not much better. Maybe it is the human trait of looking back on a golden age? A question for Jim: did his retirement from SFSU free him to state his change of mind, or has it happened since his retirement? My research in the Sierra Nevada evoked much skepticism. To understand changes in wildlife I needed to understand all factors affecting regional climate change. Natural ocean cycles and landscape changes appeared to dominate. My retirement simply allowed me to delve deeper into climate change and to write more. Fortunately, Reality is finally beginning to intrude upon the dangerous global warming meme. I find your comment about regional climate change very interesting, as I have felt for a long time that climate change has been localised rather than uniform over the whole world. Some climates seem to have been affected by human action such as deforestation or overgrazing. In the UK since the 1940s the climate has been on a roller coaster with hot and cold seasons and dry years. The dryest year I have recorded was 19 inches in1983 and the wettest was just over 40 inches in 2000. There have also been a couple of hurricanes in 1703 and 1987. We have had very hot years in 1959, 1975 ,1976 and 2018 and very cold winters in 1947, 1968, the 1970s and early 1980s, and last year we had the Beast from the East. I had a cherry-plum tree that I used to gauge whether it was an early or late Spring. The earliest that it flowered was 1st February and the latest was 1st April. Many of the CAGW commentators seem to be very young and have not experienced much in the way of extreme weather, and seem to disregard previous experience of us ol’! 1963 was a very cold winter in the UK. 1968 – possibly a typo as I don’t remember it as being notably cold. We did have snow in 1969, IIRC. One thing will help surviving the Eddy Minimum. Gen4 nuclear which is safe (no possible meltdown) and uses current nuclear waste as fuel. Each unit will be very small and serve a local area. No need for a power grid. It will also pacify the AGW alarmists since it generates no CO2 at all. Arrhenius feared the oceans would soak up any benefit that CO2 might confer on the climate. Callendar hoped CO2 would save us from “the deadly glaciers.” Revelle considered it a wonderful experiment we were doing with nature. The Soviets dreamed of a way to promote global warming and free up Arctic shipping., even considering damming the Bering Strait. Then in the 60s Emiliani’s deep sea cores in the Carribean showed not only were ice ages cyclical but that they corresponded well with Milankovitch’s insolation calculations. So it became apparent we were near the end of the present interglacial. Global cooling was just beginning. 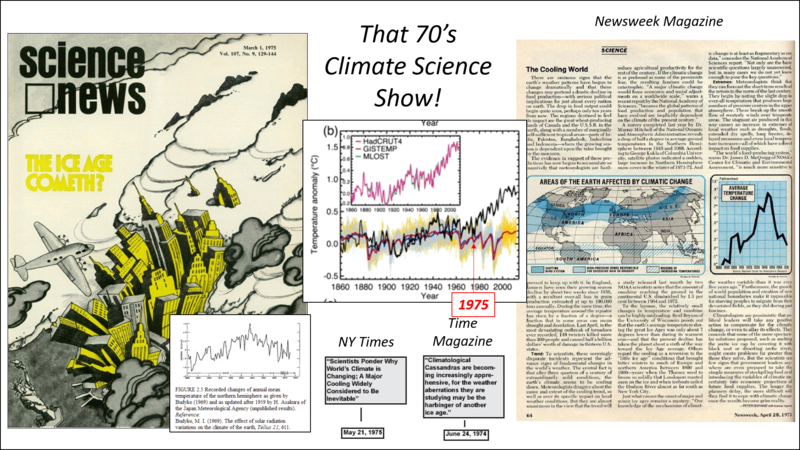 A few physicists were skeptical, Budyko, Singer, Seitz, Nierenberg, thought CO2 would win in the end, and they lobbied for funding to keep a close eye on the climate. Bryson, ever the cooler, and Suomi, his erstwhile partner, parted the ways over the issue. Suomi wanted satellite observations. Then the globe started warming a little, late 70s, and former coolers jumped onto the warming bandwagon. We might get lucky after all. Or worse. The predicted oil peak never happened, and Revelle’s experiment was on in earnest. In 1978 the CIA was warning the President of the security threat of a cooling climate. In 1988 James Hansen was warning congress of an imminent threat of warming disaster. NeoMalthusians and the Club of Rome saw considerable potential in the crisis, and billionaire socialists in the East and West took up the cause; with a billion dollars you can buy a thousand millionaires. The IPCC began to exaggerate. Pachauri sensationalized the Himalayan glaciers with bad data. Santer overstated the science. The big three, Singer, Seitz, and Nierenberg, didn’t like what they were seeing, and said so. In response Naomi Oreskes and NASA historian Eric Conway wrote a book, “Merchants of Doubt,” intended to smear their reputations and destroy their credibility (and these were the guys who worried about warming in a world of coolers! ): they were career skeptics for hire, in the pockets of Big Tobacco and Big Oil. It is strange what weather we have had all this winter; no cold at all; but the ways are dusty, and the flyes fly up and down, and the rose-bushes are full of leaves, such a time of the year as was never known in this world before here. The Fast to be observed in Westm. Abbey, and the Bp. of St. David’s to preach. ¶Whereas His Majesty hath been pleased, by Proclamation, upon the Unseasonableness of the Weather, to command a general and public Fast, to be religiously and solemnly kept, within the Cities of London and Westm. and Places adjacent: It is ORDERED, by the Lords Spiritual and Temporal, in Parliament assembled. Meanwhile, however, with the decrease in solar cycles the population is falling. Why do all the world’s top scientists believe gkobal warming is an existential threat to our way of life? So when the cold sets in the Mediterranean will be festooned with leaky dinghies heading south to Libya. The collapse of the Cahokia Mound Builders’ Civilization. All collapses linked to droughts as contributors. We are presently living in a golden age of abundance not seen since the Medieval Warm Period. Then it created a new age of renaissance art as people no longer had to spend dawn to dusk hunting or growing food just to keep alive. Now it has created a new age of technology and social media. Enjoy it while it lasts because the next age will be a cold one with crop failures, famines and disease, and billions of people will die. Jesus, Lord help us! Throw the money makers out on a glacier; like you did in B.C., before A.D. Let us live with out your hogwash before it sinks New York and East Anglia. Jesus, Lord help us! Throw the money makers out on a glacier; like you did in B.C. before A.D. Let us live without the hogwash of them before it sinks New York and East Anglia to Hell. I thought Mann was a LIA denier? Why is the UN’s IPCC apparently worried about a tiny 2 C, when they say we are already two thirds there from 1850.
would expect it to get a little warmer, back to how it was before the LIA. And what about the hundreds of years of the Roman Empire, and before that the Minion warm period, or were they just a quick snap of summer, Ha Ha. All the historical evidence clearly shows that a long term warm period results in far less violent weather, but of course a modern IPCC forecast saying a bit warmer and less violent weather will not be any good for the Medias scare campaign. And the politicians will not be able to frighten the population as they like doing. There were not even any watermelons around back then to espouse eating lots of cattle and to burn coal to save the planet from run away cold.